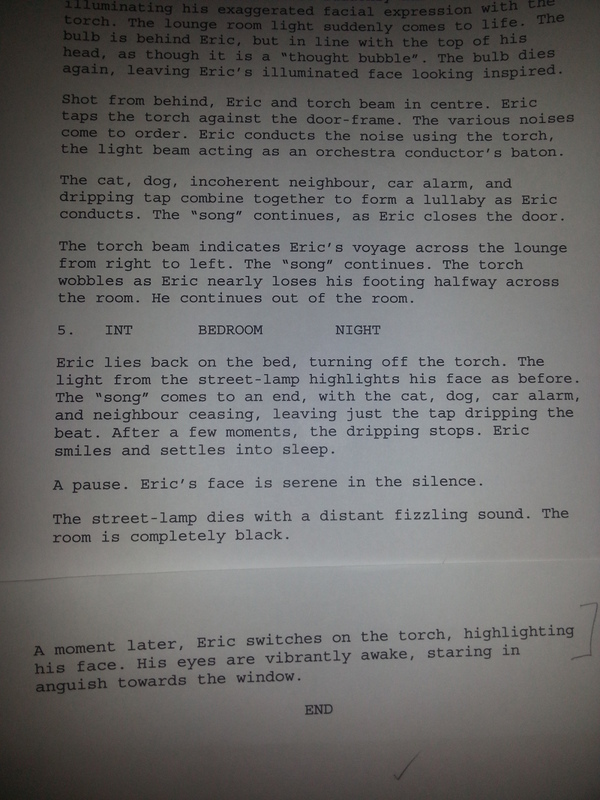 Back in the midsts of time, I did a few scriptwriting modules at uni. Some of the short film assignments were handed over to the film-making students for their term projects. Apparently one of mine got a gueurnsey, with an invite to the debut screening to follow. “Will there be free drinks?” I asked, but didn’t get a satisfactory answer. Heard no more, thought no more about it. Assumed it never eventuated. Until pootling about the internetz, when I happened upon it. Well, a version, given a fair bit of directorial license. Still has the quite dreadful title I bequeathed upon it, being a lame pun on “Goodbye, Mr Chips”. And all things considered, I had a couple of other scripts that were much more interesting. All revolved around sleep for some reason, but then, I was a student. This was a sound and visuals experiment to prove to my tutor that I could write something without reams of dialogue. 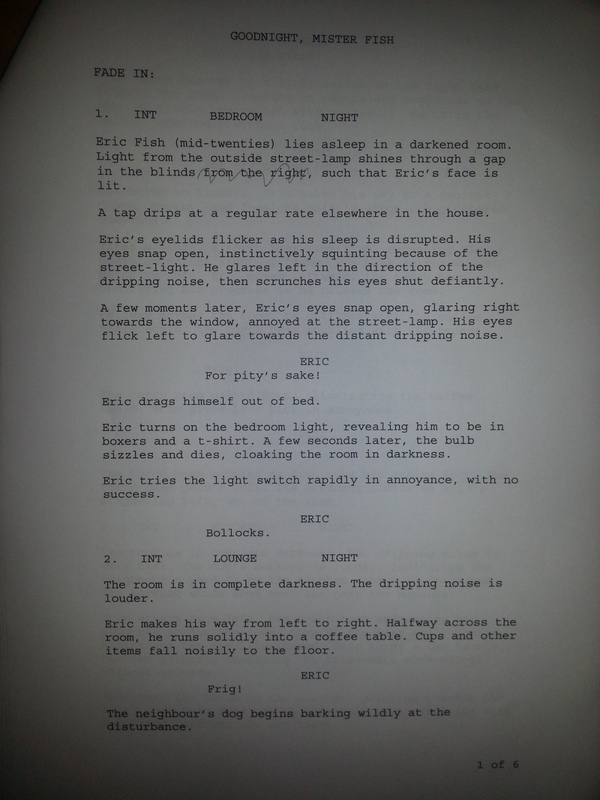 Having dug out the script, I recoiled in horror at the over-writing he so rightly castigated me for. I almost need to be physically held back not to get a red pen to it now. In my head it was visually all about a dark screen with just a torch-beam moving through the house, but I see now that would have been a lighting guy’s nightmare. Interesting to see decisions and deviations from the initial script, quite a different beast really. So much so, there’s no writer credit! Ah, that’s film for ya. Or maybe the uni removed names from the assignment pages. Whatever. Different ending too. The original had the streetlight going out, its absence waking the guy up again, but I didn’t really express that very clearly and was cumbersome to show. So there’s some dirty washing aired, my gruesome levels of over-writing of yore. Fortunately, my tutor, Murray Oliver, soon fixed that. His technique was to put people’s script on overheard projector for all to see then rip it to shreds. Now that teaches you to cut the crap. Moral of the story: Maybe I should stop idly googling things …. you never know what you’ll come across. This entry was posted in Editing, Short film, Writing. Bookmark the permalink.